To prepare the dough, stir together yeast, 1 tsp caster sugar and ¼ c warm (110°F) water in the bowl of a stand mixer. Let stand until foamy, about 5 minutes. Add ½ c butter, ½ c caster sugar, 1 tsp salt, eggs, milk and 2 c flour to bowl. Mix on low speed with a paddle attachment just until dough comes together, about 1 minute. Switch to a dough hook and add additional 2 ½ c flour. Beat on medium speed until dough is smooth but still sticky, about 5 minutes. Turn dough out onto a surface floured with remaining ½ c flour and knead until mostly smooth and almost no stickiness remains, being sure to incorporate all of the flour on the surface. Transfer to a large lightly greased bowl, turning once to grease top of dough. Cover with plastic wrap and let rise in a warm (80°F) place for 1 hour, or until doubled in size. To make topping, stir together all topping ingredients except for the pecans in a medium bowl. 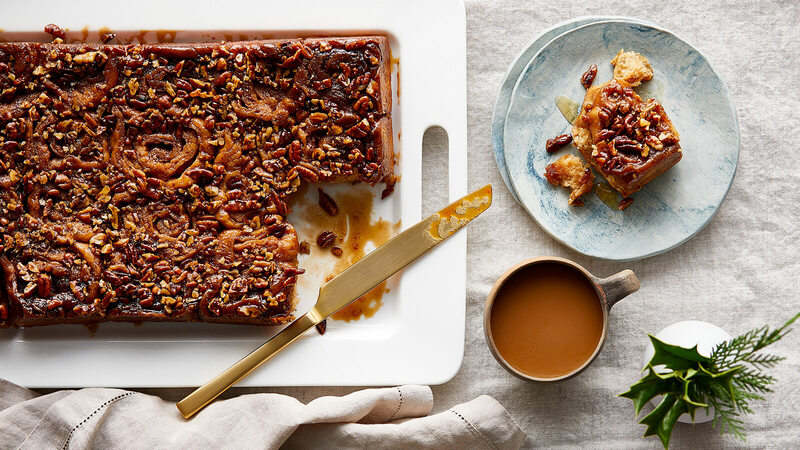 Pour into a lightly greased 13x9-inch metal baking pan, spread across the bottom, and sprinkle evenly with pecans. To complete the buns, combine remaining ¼ c caster sugar, ½ c muscovado sugar and ½ tsp salt in a small bowl. Turn dough out on a lightly floured surface and roll out to 20x14-inch rectangle. With remaining ½ c softened butter, dollop heaping teaspoons over surface of dough and gently spread into an even layer using rubber spatula. Sprinkle evenly with brown sugar mixture. Starting at one long side, roll dough into a log. Cut dough into 15 rounds, a little less than 1 ½-inches thick each. Place buns, cut side up, in prepared pan. Cover with plastic wrap and refrigerate overnight. Place pan, still covered with plastic wrap, and a large bowl of very hot water in oven without turning oven on. Let stand until buns double in size, about 1 hour. Remove pan and water from oven, discard plastic wrap, and preheat to 375ºF. Bake until golden brown, about 20 minutes. Let buns cool in pan on a wire rack for 5 minutes. Carefully invert onto a serving tray and serve warm.